So this is one of my all time favorites. It has shapes, symbolism, friends and food. So its a great event all round in my book. What is the Advent Spiral? The Advent Spiral is an important part of the Steiner Waldorf homeschool calendar. It symbolizes finding light in the darkness. Advent is not just one moment, it is a period of time. It is the few weeks before Christmas, advent is a time of quiet preparation as we go into the darkest days of the year. The shortest day (in the northern hemisphere) is close to Christmas day, so by the time we celebrate Christmas we have reached a turning point and the days begin to lengthen again, the daylight increasing and nature will begin very slowly to reawaken. Advent in the Christian church is a time of preparation for the nativity of Jesus, and includes four sunday services with candles lit to mark the time passing. So we often think of Christmas as the birth of light. As for the spiral significance (I could go on forever about this). The spiral image can be found in all cultures, ranging from primitive art to 21st century advertising. The spiral is often associated with the cycle of rebirth, time and seasons and sometimes a spiritual journey. So for the advent spiral we walk to the centre in search of light and spread that light throughout the spiral bringing light into the darkest days of the year up to Christmas. Steiner groups state that is an experience for those up to the age of six or seven but you know your own child. Older children can still take part helping younger siblings. The advent spiral itself for this custom is made from evergreen branches, when it is set up inside you get the wonderful aroma from all the greenery. 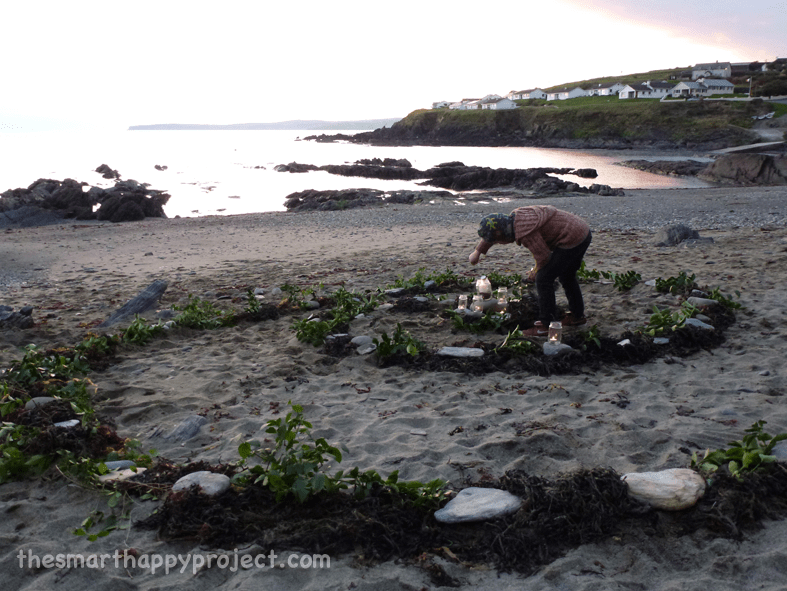 But this year we have had such bright, dry weather recently we set up our spiral outside on a little beach near us. 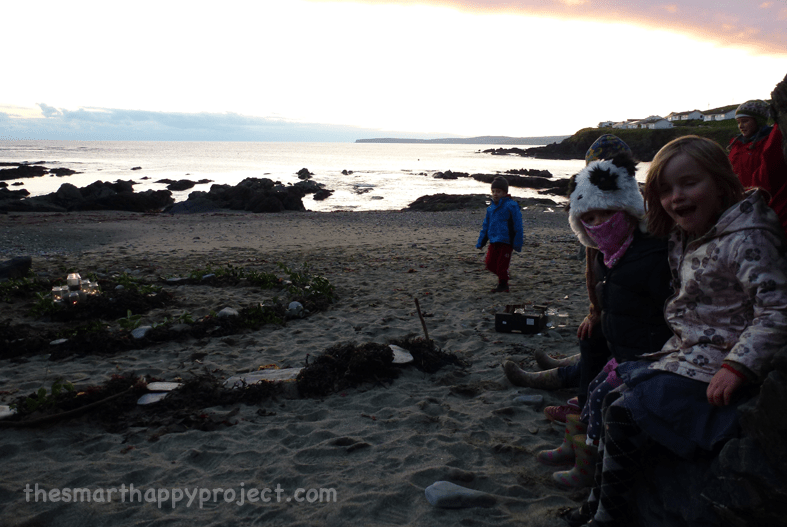 A couple of families took part and we set up the spiral during the day then returned just before darkness fell. Create your spiral. Collect lots of evergreen branches and arrange into a spiral shape, it doesn’t have to be too large. Start at the centre and arrange a largish candle on a small table. From here mark a spiral coming out from this centre and pile up the greenery along this line so that there is a pathway inside the spiral line. The spiral only need turn one and a half times. Don’t panic about it not being accurate, its not about that its about the journey. Mark it out roughly then just keep layering it up with more greenery to enhance the effect. 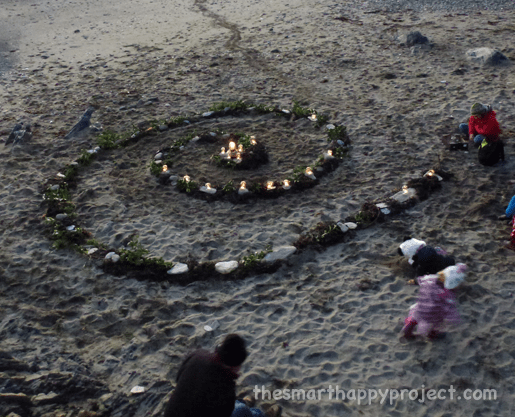 We started by using a little greenery and then put in lots of seaweed that was on the beach (it fitted our location), so we had a seashore themed spiral. We collected large flattish stones and placed them along the path of the finished spiral. These were to help to create areas to place the children’s candles during the ceremony, but you don’t have to do this. Collect your candles. One for each child who is taking part. Short candlesticks are preferable as they are easy for children to light, but as we were outside we opted for tea-lights in glass jars to shelter from any wind. TOP TIP: Using candlesticks is recommended. 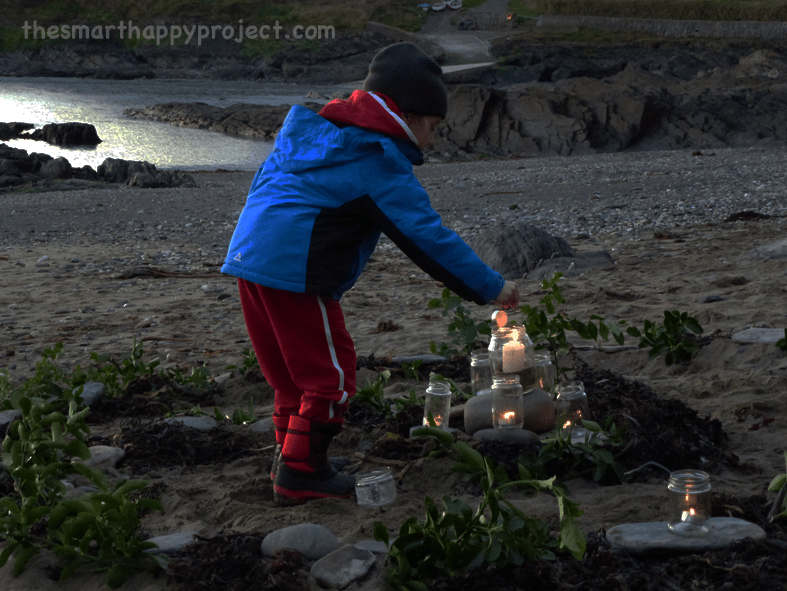 Tea lights are harder to light for children, we suffered from this and they did need some help. If they can do it themselves its great, but if they need help to light it’s not the end of the world. If it’s happening inside candlesticks can easily be lit on their own. When you have the candlesticks, collect one apple for each candle and after removing the core sit the candle in the apple, this creates a neat little holder and also carries the significance of rebirth. All gather outside the room at the allotted time, just when it’s dark it ideal. It’s important to create the right atmosphere of reverence. Explain a little about what is going to happen and why we are doing it then all go in quietly. When you all enter the room there is the wonderful smell of the greenery and it looks so great with the candle in the centre. Parents watching sit around the outside and children taking part sit near the opening of the spiral path. As we were outside we met at the path to the beach and then all climbed down the rocks together. Kids making a mad dash across the sand while trying to retain the sense of reverence! Each child taking part steps up to the Candle Angel (parent, teacher or older sibling) who passes out the unlit candlesticks in turn. 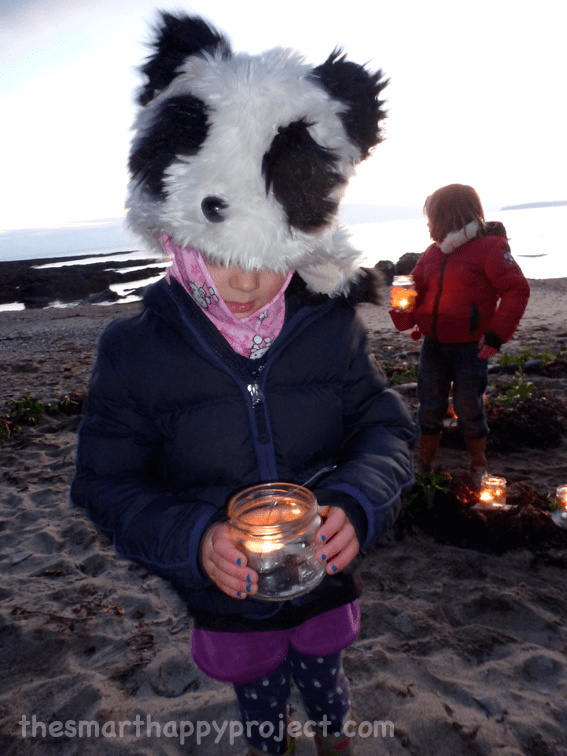 Each child walks on their own along the path into the centre of the spiral and lights their candle from the centre candle. 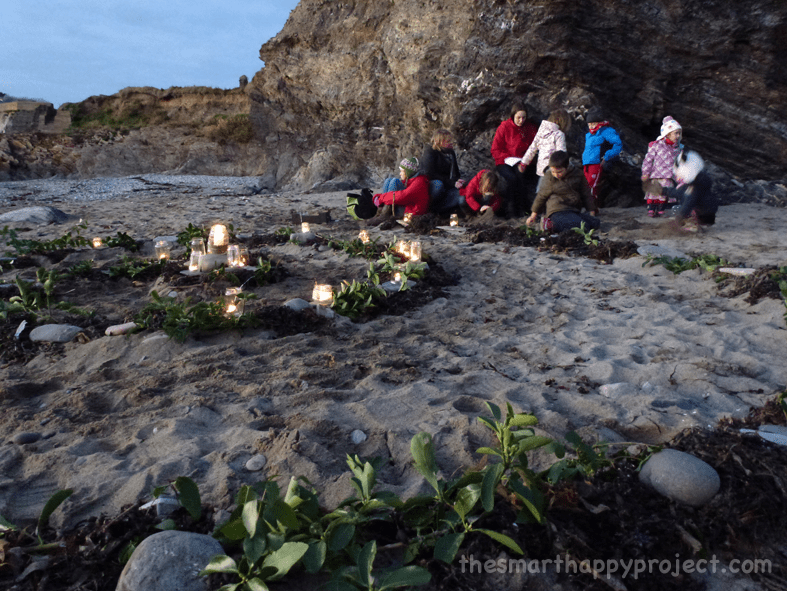 Then they turn and walk outwards through the spiral and select a position within the greenery (we had the stones laid out) to place their lit candle. Then return to sit outside the spiral to observe the next child. Each child takes the same journey and places their candle within the spiral so gradually the light grows as more and more candles are lit. 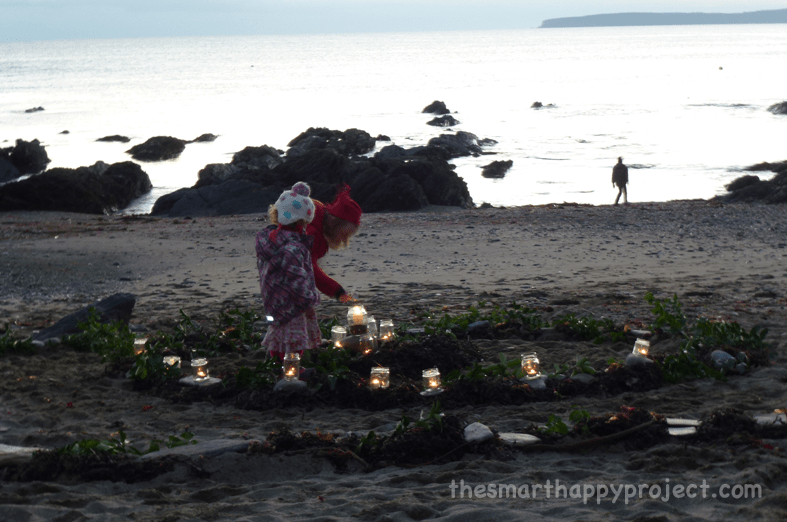 We had six children taking part so each had a second turn to create more light. After each child has taken their journey we had a story reading from an ‘Advent and Christmas Stories’ book (hawthorn press) called ‘the Story of the Crystal’ about gnomes who set out with dull crystals to find out why the light is leaving mother earth. The gnomes walked through starry nights and met shepherds and angels and eventually arrived at a stable with baby Jesus who when he saw the crystals caused them to light and shine again. After the story we finished up, we wanted to get back up the rocks before dark. Some feel it is important to leave the spiral intact when all the children leave, continuing the feeling of reverence and respect but practicality of your situation may dictate this. 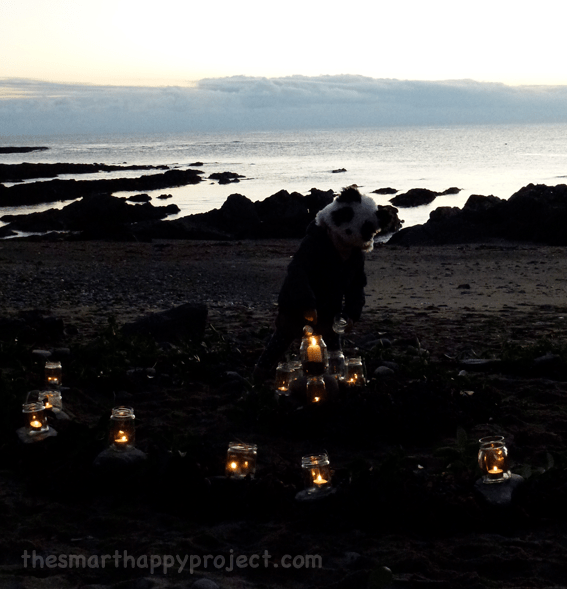 We took the candles with us, but a few days later the tide having been kind to us we found our sea weedy spiral still sitting on the beach waiting to be washed away. As with many Steiner customs, the sharing of food follows. So we all brought a dish and shared a meal together back inside the warm. Yum. For Waldorf homeschool purists who might be reading this, maybe we didn’t fulfill everything. We didn’t wear white as it was just a bit cold for that, but we understood the significance and created the correct mood. Most of all, our hearts were in the right place. What’s interesting about this custom as a parent is seeing how your young child reacts to a solo experience. It can be a quiet confidence building exercise as they walk the spiral alone and light their candle and to return to their family. A safe place to break out on their own and grow in their confidence in front of a group. Advent sunday being this sunday 1st Dec its not too late if you’d like to have your own spiral. Whatever you choose to do to for advent, may your days be filled with light as the nights draw in and you prepare to celebrate Christmas together. If you like this post (really what’s not to like?) please share it with three friends. The Smart Happy Project is a new, quality magazine for children with a strong community currently growing through word of mouth. It’s mission is to connect children to nature through the natural geometry that we see all around us. Please help spread that mission by sharing on social media and using the ‘send link to a friend’ button below. If you haven’t already, sign up for the email membership to keep up to date of the progress of the magazine launch and to receive activities straight to your inbox.